The Conclave-Watcher’s Lexicon: What Do They Mean When They Say That? 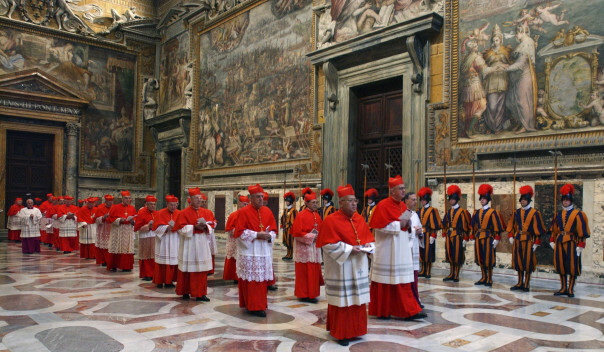 You are at:Home»Featured»The Conclave-Watcher’s Lexicon: What Do They Mean When They Say That? The media and pundits, as well as churchmen, use a lot of jargon that many ordinary readers, unaccustomed to romanità, the carefully encoded diplomatic language used by the Vatican and its cadre of experts, will not be familiar with. A lot of the writing leading up to the conclave is about the “priorities” of the new pope. What should he do? This is where the issues start bumping up against both the jargon and the factions. Since the cancellation last week of a series of press conferences organized by the Pontifical North American College, the cardinals have gone nearly silent. With one day left before the voting begins for a new pope, we have only the “experts” and pundits to guide our thoughts. Everyone is trying to piece together an overview of the situation, and the positions of the cardinals on an array of issues, a task that can prove daunting to those new to the Vatican-watching scene. A small number of cardinals are still giving interviews to some MSM outlets, including Washington’s Donald Wuerl, who told La Stampa on Friday that he does not think this will be a short conclave. For those with ears to hear, Wuerl gave a signal to the other cardinals when he alluded to “collegiality,” a Vatican II buzzword meaning the union of all the bishops of the world with the pope. Wuerl told La Stampa that the new pope must focus on strengthening the relations between the “local church,” meaning the national bishops’ conferences, and the Vatican, a point that places him inside the “progressivist” camp. Since the 1960s, the Church in the western world, especially in Europe, has been locked in a power struggle between those supporting the “local church” who want to protect the power of the national bishops’ conferences – a post-Vatican II innovation – against the centralized authority of the papacy. The growing power of the national conferences, which is often opposed to the canonical authority of a bishop in his own diocese, was one of the most serious obstacles to reform facing Pope Benedict. In one of his books, the former Cardinal Ratzinger wrote that the national bishops’ conferences had become a power-brokering machine never envisioned by the Council. In the case of his own native Germany, the bishops’ conference openly defied both Benedict’s and his predecessor’s authority when they were ordered to cease being involved in the government’s scheme allowing women to obtain abortions. Wresting power away from the pope and the Vatican, effectively establishing quasi-independent, national Churches is a cause dear to the hearts of most European and some American “progressivists”. Even terms with which most of us are familiar, like the “New Evangelisation” require some unpacking. Experts and cardinals alike are saying that this is a key catchphrase of this conclave. But what many don’t realize, is that term has a very specific, and strictly limited interpretation by the official Church. It does not mean converting non-Catholics to Catholicism. It means “re-presenting the historic faith” to non-practicing, fallen-away Catholics in traditionally Christian, western nations: or in other, more old-fashioned words, calling back the lapsed. In the old days, before the coming of the Second Vatican Council’s asteroid, it was normal to speak of “converting” non-Catholics as part of the mission of the Church. That was what we understood missionaries to be for. But this term, also called “proselytizing,” has become utterly anathema to some prelates – kryptonite. To be accused of attempting to convert someone Jewish or Muslim or even Anglican or Baptist or Lutheran is tantamount to being accused of a kind of spiritual genocide. Most Catholics who are not hemmed around by the new Catholic cult of political correctness that has ruled the Church for the last few decades, take it for granted that if one believes in the Catholic religion, one wants others to join it. Everyone, in fact. Because we believe its claims to be true, and, applying some basic logical principles, the claims opposed to it to be untrue, we don’t want other people to live in the darkness of error. Particularly if that error can have dire eternal consequences. But this is too much common sense for modern churchmen, wedded as many of them are to the demure and evasive politesse of the modern “ecumenical movement”. Another key catchphrase of this conclave is “transparency,” and it is often used in connection to the Vatican’s financial scandals and the “Vatileaks” scandals. A lot of this is obscure to most Catholics outside Italy. But here, where the Vatican is always in the headlines. It is one of the major themes of the news cycle. In a nutshell, the secretiveness and factionalism in the Vatican – allegedly including a group of practicing homosexuals – has left the day-to-day running of the Church in an almost unprecedented (for modern times) state of disarray. The solution, and one of the “priorities” for the new papacy is American-style “transparency” in the Church’s dealings. This call has led to headlines like that of the Globe and Mail today: “Does the Catholic church need to install a no-nonsense CEO as its next pope?” But it betrays another of the secular world’s failures, echoed unfortunately by many prelates, to understand the nature of the Church. The modern world offers little in the way of analogy for what kind of institution the Catholic Church is. Perhaps most often it is presented as a kind of multinational corporation whose dioceses and parishes around the world are branch offices with the pope as CEO. This model, while it may superficially resemble the Church’s operating structure, fundamentally fails to reveal its nature. The spiritual language describing the Church, on the one hand, as the “body of Christ,” and on the other as the “Bride of Christ” incorporate more of its reality. But such a personal, bodily, incarnational notion of ecclesiology is beyond the ken of the secular world. Others are warning that such calls are more sinister than a mere misunderstanding, however. One writer and Catholic historian explained to me that the threat of such a spiritually impoverished notion of the Church is that it would lead to it being treated as just another political economic prize to be manipulated by interested parties. He compared our current situation with that of the conclave of 1559 that elected Pope Pius IV, right in the middle of the massive upheavals of the Renaissance and Reformation. This “transparency” he said, is nothing more than “the latest fraudulent bumper sticker slogan” of those pushing the progressivist agenda of further capitulation to the secular world. A policy that “has never provided anything more than repeated opportunities for the strongest wills to triumph over Christ in the name of Reason and Progress”. Many a Prince of the Church goes in a Pope and comes out a Cardinal. Thank you for the clarification of the PC terms and buzzwords. After three black smokes, it would seem that either the Holy Spirit is being purposely circumspect or the cardinals are being purposely defiant.